Gary Lineker presents live coverage as League One Doncaster Rovers take on Crystal Palace in the fifth round of the FA Cup. 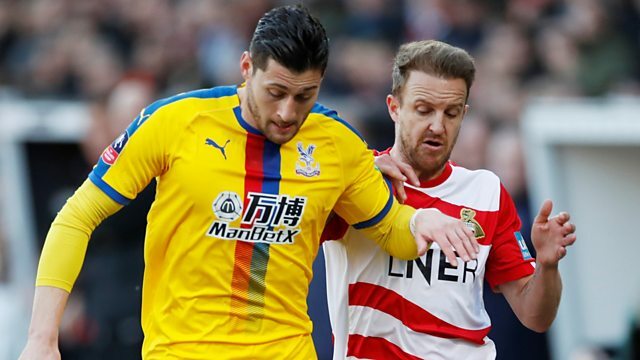 Watch live coverage as League One Doncaster Rovers aim for an FA Cup giant killing when they take on Premier League Crystal Palace. Rovers are in the fifth round for the first time in 63 years and face a Palace side who made the final in 2016. It is eight years since the sides last met at the Keepmoat Stadium, when Doncaster ran out 1-0 winners in the Championship. Live coverage is presented by Gary Lineker. Catch up with all the stories and action from the 2018/19 FA Cup.